PORT OF SURIGAO, Surigao City - Hundreds of volunteers, mostly students, trooped to this premier port of Caraga Region on Wednesday, November 13, in response to the Philippine Ports Authority’s call for help in the repacking of Marcventures Mining and Development Corporation’s P10.1-million relief goods to be sent to Tacloban City. Port Manager Engr. Isidro Butaslac, Jr. said more than three hundred volunteers turned out and helped in the repacking of thousands of assorted relief goods stacked inside the port’s huge warehouse. “Majority of these volunteers are students from Surigao Education Center and Saint Paul University. Other volunteers come from Marcventures, Boy Scouts of the Philippines- Surigao del Norte Chapter, Badminton Addicts of Surigao, dockworkers and some PPA employees. Their love to help is really overwhelming and contagious,” said Engr Butaslac. Engr. 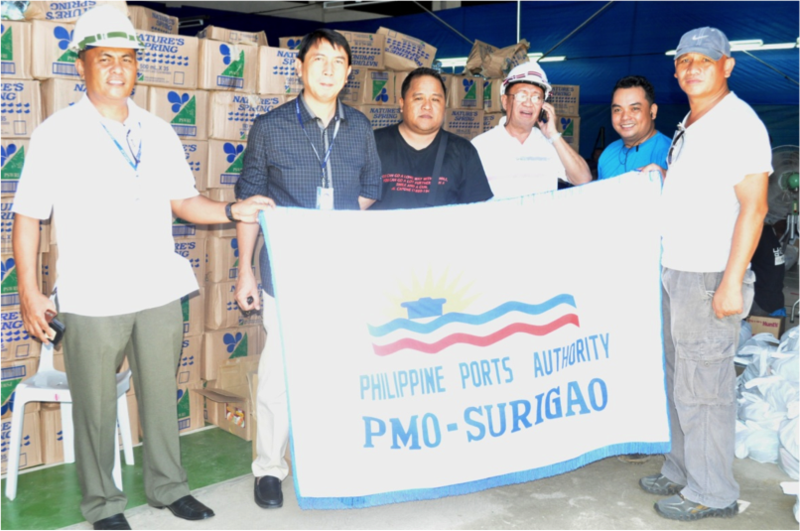 Jegie Pereda, Marcventures’ vice-president for operation, thanked PPA-Surigao for providing the free usage of its warehouse and for spearheading the repacking of the said relief goods. PP/Supt Froilan Caturla, port police commander, disclosed that he and a Marcventures representative will lead in the distribution of the said relief goods in Tacloban City on Friday, November 15. “We’re bringing about 330,000 assorted canned goods, 180,000 powdered milk packs, 150,000 bottled mineral water, 120,000 Biogesic, tens of thousands of instant noodles, toothbrush, toothpaste, soap, Diatabs and many others,” PP/Supt Caturla disclosed. He said they will also distribute 8,000 t-shirts, 7,000 pails, 1,200 cellphones, 500 tents, 200 solar lights and 11 generator sets. “These relief goods would benefit at least 34,000 persons and could help ease their suffering momentarily,” the port police chief added. Members of Caturla’s team bound for Tacloban City include PP/Insp Elvis Daguman, Roger Montilla, Freddie Romero, Jubert Mantilla, Andres Patosa, Ruel Pelares, Tata Diaz and Frisco Ramires, Jr. of PPA-Surigao, as well as Engr. Carlos Gimena and Alvin Dacoron, resident mine manager and administrative manager of Marcventures Mining and Development Corporation, respectively. Marcventures is a multi-million company engaged in the mining of nickel, copper and gold in Surigao del Sur.